I’m sorry for having such a long break between posts but this last week has been rather hectic, I’ve had appointments, blood tests, dinner with a friend and a trip to the cinema not to mention work! (Please god, don’t mention work!) One of the other things occupying me was this mammoth cupcake session. Last week after the disappointment that was The Hummingbird Bakery Cookbook I decided to risk buying The Primrose Bakery Cookbook when I came across it by chance. I am so glad I did! I tried it out last Sunday night and not only was the recipe I tried easy to do but it also created a delicious cupcake. I was intregued by the fact that the recipe is very different to most I’ve seen, the traditional sponge ratios go out of the window! I just tried the vanilla cupcake recipe to begin with but I often think it’s a very good judge of a cookbook to see how they deal with something simple. If they mess that up then what hope for the more complicated stuff? I also invested in some decent vanilla extract instead of the cheap stuff I normally buy. I do think this made a huge difference. I’ve read a bunch of articles about vanilla flavourings and I’m glad I’ve spent the extra here. The vanilla really came out as a strong flavour, perhaps a little too strong for some tastes but I’ll know for next time that I don’t need to use as much as I would ordinarily. I wasn’t very happy with the decoration on these. I’ve only managed to find one pink food colouring that doesn’t come out this delightful salmon shade and that’s Asda’s natural pink food colouring. This one was a posh paste one and I have to say I am far from impressed. Yes, you only need a tiny bit to colour your mixture but that means I now have a whole pot of the stuff to use in some way and may never finish it! I did like the stars though, both kinds are from Morrisons, the white ones are white chocolate the coloured ones are sugar. The white chocolate gave a delightful edge to the flavour of the cupcake, I’m thinking that a white chocolate buttercream may be in my future! – Heat the oven to gas mark 4 and line a 12 hole muffin tin with paper cases. – In a large mixing bowl cream together the butter and the sugar until well smooth. – Add the eggs one at a time, mixing into the mixture between additions. – Sift the flours into a separate, smaller, bowl. – Measure out the milk in a jug and then add the vanilla to this. – Add 1/3 of the flour to the large bowl. Beat well until combined. – Add 1/3 of the milk and beat again. – Add another 1/3 of the flour, then another 1/3 of the milk, then the last of the flour and then the last of the milk, beating well between additions. – Spoon the mixture into the paper cases. Fill about 2/3 full. – Bake for about 25 mins until golden brown and a skewer inserted comes out clean. – Remove from the oven and leave to cool inthe tin for 5-10 minutes. – Then turn out to cool completely on a wire rack. – Decorate as you choose. Bloodtests? All ok? I know you don’t DO needles?! I literally screamed and cried but I survived the experience… think I may have traumatised the nurse though! Basically it’s looking for any allergies or deficiencies I may have that would explain some ongoing health problems away. The last resort for me (first step for others) was bloods. Worst case scenario for me would be gluten intolerance… I don’t think there’s more than 5 things on here without gluten!!! 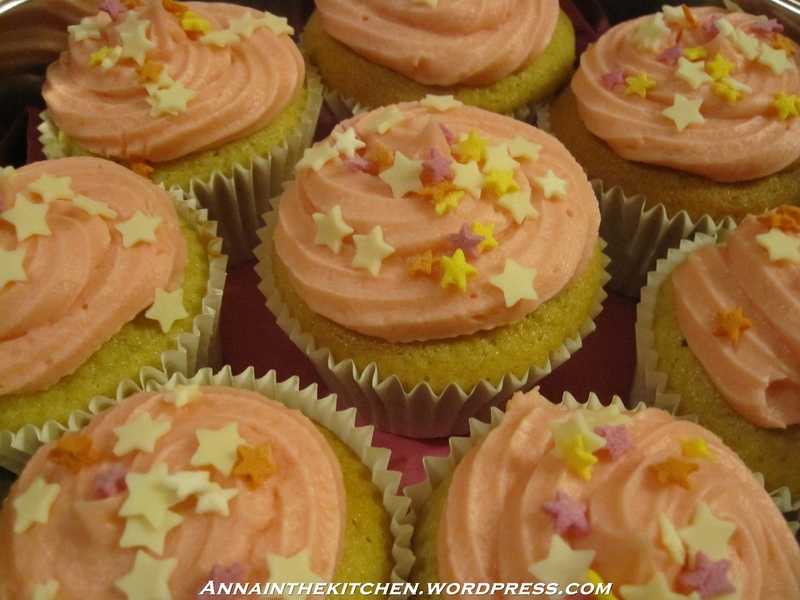 Your cakes look fab i made them yesterday but are a little crunchy on top is this normal? im wondering may take them out 2 mins earlier next time they only took 20 mins in my oven. Yes, they are supposed to have that sugar crunch layer, it makes them easier to add icing if you’re spreading instead of piping. I pipe my icing because I still can’t get great results from spreading, I’m rubbish at it! 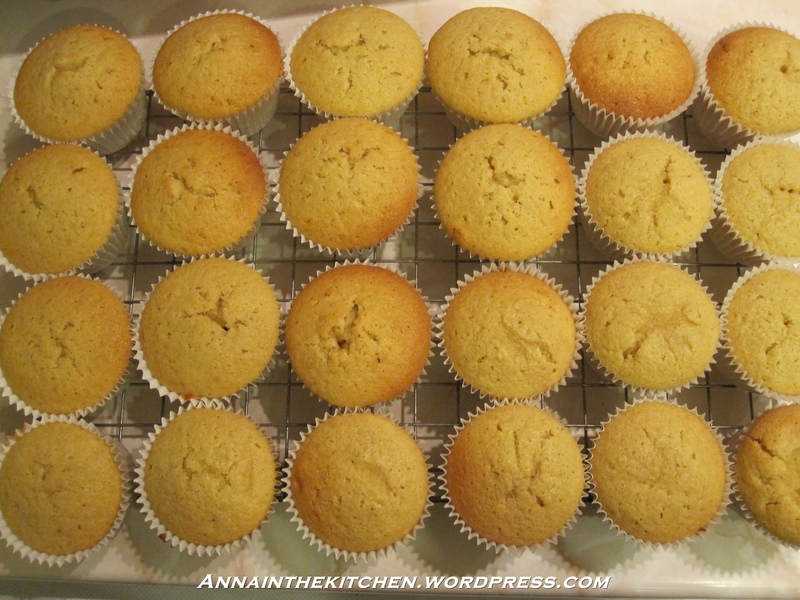 And you’re right, they are a denser cake than my usual cupcakes, which are a basic sponge. All ovens are different unfortunately, you just have to get to know your and its moods. Ours is apparently calibrated perfectly (we had the engineer out last week) but I’m afraid it’s sometimes just a matter of learning that your oven will do things x minutes fast or need y minutes more. Hope they still tasted good! Thanks for your reply you could be a great help to me if you dont mind me asking a few questions every now and then. Is this how i aks you? Im new to this baking thing!! I don’t mind you asking questions at all, I can’t promise I’ll have an answer to everything but I’ve been baking long enough to have a rough idea about what I’m doing. However I’m not sure what could be causing the cases to come away. Could just be the cases, could be they needed a minute or two longer in the oven, I’ve never had a problem with it so I can’t really help here, sorry! Made more today and they were fine, still very dence even though i didnt wisk as much!! Do you think it needs less plain flour and more self raising and baking powder? I did a batch of hummingbird bakey cup cakes and they were lovley but the mixture was like batter and didnt rise as well but were lovley and moist just need them to get bigger and ther wasnt as much mixture. My friend has asked me to do her wedding cake (cup cakes) so im trying to find a good recipe and going to do the icing from primrose bakery. I’ve just bought the primrose bakery cupcake book and I’ve made today my first cake from it. I made a double layer coffee and walnutcake. I must say I found the recipe easy to follow, I only made too much icing. In the recipe they stated 1,5 batch of the icing, but I find it enough to make 1 batch. I will post my photo’s from the cake on my blog. thanks for sharing your opinion, I really like this book. It is a nice book isn’t it! I have to admit I haven’t made anything else from it yet but I keep looking at it and bookmarking another recipe I want to try! That coffee and walnut one is definitely on the list, although I have to say I’d probably be tempted to go with 1.5 on the icing and have it really thick, I love coffee icing so much! I too bought the Primrose Bakery book and also went to have a cupcake at the Covent garden shop – not impressed, maybe I had one of an older batch as it was very dry (vanilla) and my pal had the earl greywhich was too sweet. I wish I could also master the way they spread the frosting on the top too, even with pictures I still make a complete hash of it!! iv bought the primrose bakery book and have bought another one for a friend for christmas. Very easy to follow the recipes and fantastic results to iv made the first 6 recipes of cupcakes and i am making my way through to the end fantastic book. Perfect. I will share this with my girlfriends. Many thanks. I bought this book last summer and have gradually been working my way through the recipes (although haven’t blogged much of what I’ve made yet!) – I’ve pretty much loved everything I’ve made – all the flavours are fab. I much prefer this book to the Hummingbird Bakery one which I’ve also got. I’ve had a couple of failures with the Hummingbird one and a lot of the recipes seem to be very high in sugar. I like the way the cupcakes are more substantial than a basic sponge cake would be – it’s great to find a fellow enthusiast! Love your star decorations too – very pretty! I have this book & I love it but mines full of pencil notes where I’ve discovered a little tweaking works! With this recipe I find using 5g more butter & 30ml more milk than the recipe states makes them a little more moist. Also somehow I manage to get at least 15 cakes from this recipe & twice the amount of chocolate ones than the recipe states! Not sure how that happens but they’re all decent sized!